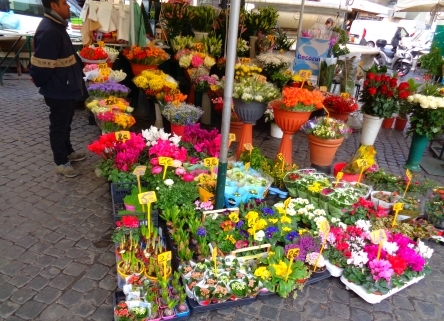 The Campo de Fiori is a central square in Rome with the most famous market of the city. The stalls are open every day except Sundays and public holidays. The market sells fruit and vegetables as well as many other products. Translated Campo de Fiori means flower square. In the past, many flowers grew on the in this time unpaved square, hence the name. Later, the square of the flowers in Rome was a place of execution. The famous philosopher Giordano Bruno from Naples was executed in Campo de Fiori in 1600. A large monument in the middle of the square recalls this. 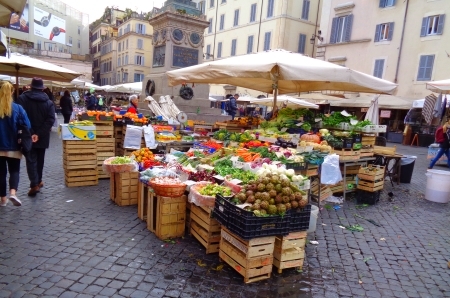 Since the 19th century the Campo de Fiori has served as a marketplace. First of all, flowers were traded. Today there are lots of vegetables and fruit. But there are also many other products, especially for tourists. These are partly kitsch, but there are also many interesting things. Among the goods of interest to tourists at the Campo de Fiori market are local foods from Italy. 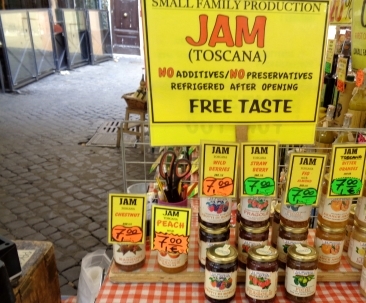 Examples are many different kinds of cheese, dried mushrooms, jam from Tuscany, vinegar (Basmati), olive oil and much more. Many foods are durable and can be taken with you home, great souvenirs from your holiday in Rome. We also liked the dried fruit. 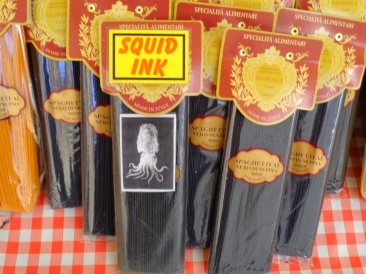 Among the tourists as souvenirs popular are also noodles like black spaghetti (color with the ink of the squids) or chili pasta. Truffles are also very popular. The Italian summer truffle (tuber aestivum) is sold in glass at the market in Rome. Unfortunately, many sellers on the Campo de Fiori are somewhat intrusive. You are usually addressed immediately in English, most of the visitors on the market are tourists. Also most signs and descriptions of the goods are nowadays in English. A stand only sells hats. Some sellers trade with clothing. Mostly they are everyday products made in China. You can also buy household goods from the fork to the saucepan at the market in the heart of Rome. We almost forgot the three florists. You should not miss them on a market, which translated means „flower field“ or „flower place“. The „Flower Square“ is in the middle of Rome. If you are interested in eating and drinking in Rome, you can book a great tour. Meeting point is at Campo di Fiori, then it goes with a great guide 4 hours through the city. It’s about wine, salami, cheese, fish, pizza, ice cream and much more. Hardly any city tour receives better ratings on the Internet. Nearby, for example, is the ancient temple Pantheon or the central Navona Square.